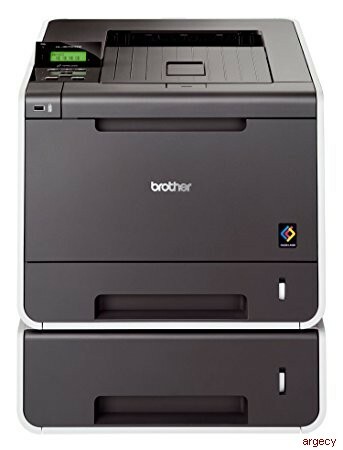 The Brother HL-4570CDWT is an affordable color laser printer with duplex and dual paper trays for a generous paper capacity of 800 sheets. Ideal for small businesses or workgroups, this dual paper tray laser printer delivers fast, brilliant color output (at up to 30ppm) so that your brochures, presentations and other business documents look crisp and professional every time. The HL-4570CDWT also features wireless networking and automatic duplex printing for two-sided documents to help save paper. In addition, optional high yield replacement toner cartridges are available to help lower your operating costs. Easily print two-sided documents.Using the duplex printing feature, you can help reduce your printing costs and produce two-sided documents, presentations and brochures. USB Direct Interface.Print PDF and JPEG files directly from your USB flash memory drive without connecting to your PC. High capacity replacement toner cartridges.Spend less time replacing supplies and help reduce operating costs by using high yield replacement toner cartridges. Outstanding Customer Support.The Brother HL-4570CDWT offers a 1 year on-site limited warranty with free phone support for the life of your product. Paper Handling Size - Multi-purpose Tray Width 2.75" to 8.5", Length 4.57" to 16"
Unit Dimensions (W"xD"xH") 16.1" x 19.5" x 17.6"
Carton Dimensions (W"xD"xH") 32.1" x 23.6" x 33.5"
Unit Weight (lbs) <59.5 lbs. < Carton Weight (lbs) 86.0 lbs. All trademarks, brand and product names are property of their respective companies. Windows Vista is a registered trademark of Microsoft Corporation. "In-Box" Consumables (Yield) Approximate toner cartridge yield in accordance with ISO/IEC 19798 (letter/A4). Drum yield is approx., and may vary by type of use. Max. Monthly Duty Cycle Maximum number of printed pages per month and can be used to compare designed durability between like Brother products.For maximum printer life, it is best to choose a printer with a duty cycle that far exceeds your print requirements. Mobile Device Compatibility Requires connection to a wireless network. Multi-purpose Tray Capacity Maximum capacity based on using 20 lb (bond) paper. Optional Memory (MB) Additional purchase required. Recommended Monthly Print Volume The recommended range of monthly printed pages to achieve the best possible performance and printer life.Printers are intended to handle occasional usage beyond this range with little or no effect.Consistently printing above the recommended print volume, however, may adversely affect the print quality or life of the machine.It is always best to choose a printer with an appropriate recommended print volume to allow for any anticipated increase in printing needs. Standard Input Paper Capacity (sheets) Maximum capacity based on using 20 lb (bond) paper.